Welcome to Jaipur, the capital and largest city of the largest Indian state of Rajasthan. 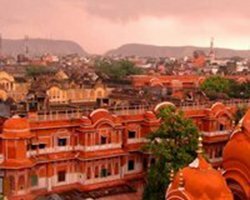 Lovingly known as the Pink City of India, the beautiful city of Jaipur is India’s planned city and was founded on 18 November 1727 by Maharaja Jai Singh II, the ruler of Amer who ruled from 1688 to 1758. The king decided to shift his capital from Amer, 11 kilometer from Jaipur city in order to accommodate the growing population and increasing scarcity of drinking water. And hence he found the beautiful planned city of Jaipur as his new capital. He himself read several books on architecture and consulted several renowned architects of that time while planning the layout of Jaipur city. Jaipur was planned on the principles of Vastu Shastra and Shilpa Shastra under the guidance of renowned architect Vidyadhar Bhattacharya. The construction of the beautiful Jaipur city was commissioned in 1726 and took 4 years to complete the major roads, palaces, and offices. The city was divided into 9 blocks, two blocks contained the state buildings and palaces, and other seven were allocated to the public. Huge ramparts were constructed around the city, pierced by seven fortified massive gates. Jaipur became one of the best planned cities and socially rich legacy urban areas in India. The city is named after its founder Maharaja Jai Singh who was a Kachhwada Rajput and ruled the ruled the region in the vicinity of 1699 and 1744. Planned according to Indian Vastu Shastra and Shilpa Shastra by renowned architect Vidyadhar Bhattacharya 1727, the city of Jaipur at present has three gates facing east, west, and north. The eastern gate is called Suraj Pol (the Sun Gate), the western gate is called Chand Pol (the Moon Gate), and the western gate faces the ancestral capital of Amer, also called Amber. During the Raja Sawai Ram Singh, the city of Jaipur was painted pink and shades of pink color to greet to the Prince of Wales, Edward VII, in 1876. Still you can see many of avenues and buildings in Jaipur city are painted in pink. This is why, the city is famously knows as the Pink City of India. Jaipur has been one of the most sought after tourist destination in Rajasthan and India as well. There are many historical places and places of tourist interest in and around the city which attract a large gathering of tourists from different parts of the world. Exploring in and around Jaipur city gives a wonderful and mesmerizing tourism experience to cherish for lifetime. You will have a wonderful opportunity to see several historical monuments including majestic forts, palatial palaces, stunning temples, and beautiful gardens. The beauty of Jaipur and its forts and palaces will never fail to lure you. If you are looking for a tourism destination in India that can provide you amazing experience of cultural and heritage sightseeing then Jaipur would be one of the best destinations for you. There are numerous places of interest and attractions in and around Jaipur city which will mesmerize you. Must visit forts and palaces in the city are Amer Fort (also called Amber Fort), Jaigarh Fort, Nahargarh Fort, Moti Dungri Fort, Jal Mahal, Hawa Mahal, Rambagh Palace, Diggi Palace, and Sisodia Rani Garden & Palace. Apart from forts and palaces there are several beautiful temples which will also amaze you on your Jaipur sightseeing tour. Digambar Jain Temple, Birla Mandir (Laxmi Narayan Temple), Galtaji Temple, Govind Dev Ji Temple (located within the City Palace Complex), Kanak Vrindavan, and Shila Devi Mandir are temples which you will like to see on your Jaipur tour in Rajasthan, India. Jaipur is also famous among tourists for its beautiful parks and gardens. Central Park, Ram Niwas Garden, Sisodia Rani Garden & Palace, Smriti Van, and Jawahar Circle are beautiful gardens where you can spend your quality time. Exploring famous museums of Jaipur will provide you a great experience and opportunity to know about rich legacy of the city and its rulers. Albert Hall Museum, City Palace Museum (located in City Palace Complex), Sheesh Mahal Museum (located in Nahargarh Fort), and Jaipur Wax Museum (located in Nahargarh Fort) are museums which are famous among tourists. There are several other attractions and places of interest in and around the beautiful Pink City of Jaipur. Jaipur Zoo, Jantar Mantar Observatory, Raj Mandir Cinema, Jawahar Kala Kendra, Ramgarh Lake, and Rajasthan Assembly Building are some other attractions to see which you can include in the itinerary of your Jaipur city tour in Rajasthan, India. Jaipur city is also known for its colorful fairs and festivals among tourists. Visitors come from different parts of the world during festivals to know and understand the rich legacy, culture and tradition. Elephant festival and Gangaur Festival are very famous among tourists. These festivals are celebrated with great zeal and enthusiasm.